Be the first to share your favorite memory, photo or story of Georgia. This memorial page is dedicated for family, friends and future generations to celebrate the life of their loved one. Georgia Eva Sutton, age 87, of Racine and formerly of Spring Grove, passed away peacefully on Tuesday, April 9, 2019 at Ascension All Saints Hospital in Racine, WI., surrounded by her loving family. Georgia was born December 15, 1931 in Spring Grove to George W. and Agnes (Weber) May. On May 3, 1952 she married Robert W. Sutton. Georgia was a longtime resident of Spring Grove and recently resided in Racine. The oldest of five children, Georgia graduated from Richmond Burton High School class of 1949. Upon graduating she married her high school sweetheart and started her family, living in Richmond at the time. Once her family was established, Georgia enrolled into the Don Roberts School of Cosmetology in McHenry where she served many of her friends and neighbors in the community working from the comfort of her home. 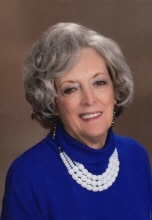 For many years, she also proudly served many customers at Wilmot Stage and for a short time she worked at Steffan’s Jewelers fulfilling her love of jewelry. Over the years, Georgia served as an election judge, was a member of the Red Hat Society, and attended Bible study in Racine for senior's. She was very fashionable and posed an extraordinary flare for design and decorating. Georgia was also a two time cancer survivor. But most of all, Georgia was a loving wife, mother, grandmother and great-grandmother who was loved by all and will be missed by many. Georgia is survived by her four children, Dean (Pamela) Sutton, Diana (Lloyd) Nelson, Julianne (Joseph) Gort, Sandra (Emil) Marunde; grandchildren, Jennifer Osborne, Valerie Sutton, Betsy (Nicolas) Wolfe, Caroline (James) Sparks, Brian Knowlton, Karyn Nelson, Andrea (Andrew) Shepherd, Bradley (Holly) Knowlton, Sarah Gort, Allison Gort, Elizabeth Marunde, Christopher Gort, Anna Marunde, Madelynn Marunde; 15 great-grandchildren; a son-in-law, Rick Knowlton; a sister, Donna (the late Ken) Larson; a brother, Jim (Nancy) May; a sister-in-law, Judy May; and many nieces and nephews. She was preceded in death by her parents; husband, Robert Sutton; a daughter, Cynthia Ann Knowlton; a great-granddaughter, Jamie Shepherd; a sister, Diane McGuan; and a brother Paul May. Visitation will be on Saturday, April 13, 2019 from 12 noon until the 2 p.m. Memorial Service at Thompson Spring Grove Funeral Home, 8103 Wilmot Road, Spring Grove, IL 60081. Memorials to the family of Georgia Eva Sutton would be greatly appreciated. For additional information, please call the funeral home 815-675-0550. To send flowers or a remembrance gift to the family of Georgia Eva Sutton, please visit our Tribute Store. "Email Address" would like to share the life celebration of Georgia Eva Sutton. Click on the "link" to go to share a favorite memory or leave a condolence message for the family.